The master tea brewer for Barry’s Tea, Denis Daly, explains how you should be making your tea. THOUGH WE’VE BEEN tea lovers for donkey’s years now, Irish people have not exactly mastered the art of tea making. 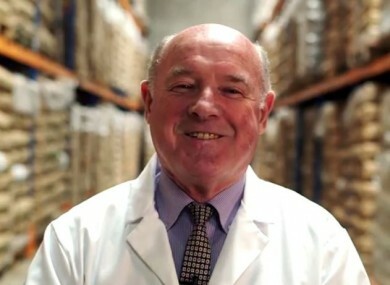 Denis Daly has been working for Barry’s Tea in Cork since 1969, and has been a master tea brewer at the company for around 40 years. I don’t think they give it enough time to brew. They just put the teabag into the mug and swirl it around, agitate it a bit. If they want it stronger, they’ll squeeze it. It’s all done now in a minute, maybe less than a minute. But normally, for tea to percolate you have to let [the teabag] rest for two or three minutes. If you like it stronger, you can squeeze it. Ah no, it’s usually after. Every day he tastes several different types of tea from Kenya and Rwanda in Africa and Assam in India, in order to determine which kinds will be blended together to create the tea you buy in the shops. Denis says that on a normal week, he could taste up to 450 cups of tea. And he still enjoys a cup or three in his spare time, too. It’s a pleasant drink, it’s a sociable drink, it’s relaxing. That’s what it’s all about. Just make sure that you have a good blend. If you want more information on Denis and tea brewing, check out this video by Barry’s Tea. And go have a cuppa. You deserve it. Email “Here are the worst mistakes Irish people make when brewing a cup of tea”. Feedback on “Here are the worst mistakes Irish people make when brewing a cup of tea”.